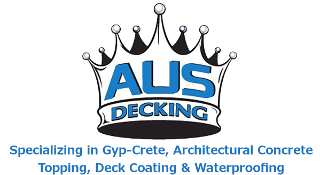 AUS - AUS Decking, Inc.
provides premier Gyp-Crete, sound-mat, concrete, waterproofing, and deck repair services that are guaranteed to meet customer’s satisfaction. In an ever changing industry, Builders, Architects, and Home Owners can rest assured that AUS Decking, Inc. is up to date with the latest requirements of application and safety guidelines. With over three decades of service in the Northern California and West Nevada regions, AUS is able to help Residential and Commercial customers transform their projects. Partnered with innovative manufacturers, Maxxon Corporation, Pli-Dek Systems and Tremco, AUS can offer mutually beneficial packaged scopes of work and create new, value engineered systems. Gypsum concrete floor underlayment for improved sound performance, fire resistance and resilient surfaces for floor coverings. AUS offers the sound control mats with low profile and high sound transmission class for economical solutions to newest innovations. We offer superior specialty coatings that are durable and long lasting to provide you a waterproofing barrier that repels water and keeps moisture out of your building. Since Gyp-Crete was first developed in 1972, Maxxon Corporation, has provided superior underlayment products for solving virtually any floor problem. Maxxon not only started the industry, but continues to lead it with high quality products, training, research, and expert installation by a network of authorized dealers throughout North America. Pli-Dek, Inc. manufactures a wide variety of specialty coatings for the building industry; waterproof deck coatings, fluid applied waterproofing membranes, epoxy flooring and concrete coatings. Tremco provides a complete range of products in the industry with below-grade waterproofing systems, air barrier systems, deck coatings, high-performance sealants, comprehensive glazing systems, firestopping solutions and engineered transition assemblies. AUS is located in the central valley of California and our dedicated team of highly experienced professionals will meet and exceed your needs. Customer service second to none but us. We are the best in the business and we guarantee our clients will be the most satisfied.